We left Nuku Hiva on June 1st and took a little over 4 days to cover the roughly 500 nautical miles to Makemo atoll in the Tuamotus. Winds were pretty good for the first three days of the passage with the exception of one squally night. A day or so into the passage we started to hear, on the radio and via weather faxes, about a big high pressure system that was going to be moving in from the southwest. The forecast was calling for some rain associated with a cold front followed by reinforced trade winds in the 25 knot range. We can handle that kind of weather with no real problem but the associated seas do make things a bit uncomfortable and, more importantly, they make the passes into the atolls much harder to negotiate. Atolls are essentially old islands that have eroded or subsided into the sea leaving behind a ring of coral reef with a lagoon in the middle. Most of the atolls that we're interested in visiting are the ones that have navigable passes through the ring of coral. It's much nicer to get inside the lagoon so that you can be protected from the swell. Inside, you can be anchored in flat water even if the wind is blowing hard. The downside is that going through the passes is not always easy. As the tides and winds change, the ocean flows in and out of the atolls though the passes and the currents can get quite strong - up to 8 knots in some cases and, if the wind is opposing the current, really big waves can develop. There's no way that Architeuthis (or most cruising boats for that matter) could make progress against an 8 knot current so we had to time our entrance carefully. Our first atoll was Makemo and we figured out that we would just be able to make the last slack current before the cold front hit bringing rain and higher winds but we'd have to hurry. Of course the winds decided to be fickle during the passage. We'd topped off the fuel in Nuku Hiva and didn't relish the idea of trying to enter the pass and make our way through the lagoon to the anchorage in rain and high wind so we opted to motor in conditions where, on more relaxed passages, we would have been content to just sail along slowly in light airs. We still like to avoid motoring if we can so our rush also inspired us to dig out our light air sails in an attempt to keep our speed up and get to Makemo in time. Fortunately, we were sailing with Shalimar and Alex was able to get the first ever photos of Architeuthis with all of her light air sails up - including our new asymmetrical spinnaker (rigged like a symmetrical spinnaker in this case because the wind was well aft). After a full night of motoring, we made it to the pass at Makemo at the appointed time - just before slack current. We could see the dark clouds and rain of the cold front approaching from the southwest so we decided to tackle the pass before the current had completely slacked off. We bounced around in the turbulent waters and had to run our engine a bit harder than I typically like to and at one point were only making about 1.5 knots against the current (I'd guess the current was running a little less than 5 knots) but we made it through alright with Shalimar right behind us. Now we just had to make it to the anchorage in the southeast corner of the atoll, about 10 nm away. When transiting through the lagoons of these atolls, you have to keep a lookout for coral heads. Some of these coral heads make miniature seamounts that reach from the bottom at 100 feet or more up to within a foot of the surface with a slope so steep that the depth sounder gives you practically no warning. Some of the atoll lagoons are well charted and have their hazardous coral heads marked. Makemo is not one of these. The only portion of the lagoon that's charted and marked is the area within a short distance of the pass. We knew the best protection from the coming winds would be found in the southeast corner so we hurrying off into uncharted waters. The good news is that, in the right condition such as those we were experiencing, the shallow dangerous coral heads are really easy to see. As long as the sun is above or behind you and the water's not too choppy, you can see these things coming from way off and steering around them is no problem. The first hour and a half of our two hour trip down the inside of the lagoon was no problem but we could see the dark clouds closing in. With a couple of miles left to go, the sun got swallowed up by the dark clouds and what had been total flat calm turned into light wind out of the north. A few minutes later, the wind veered around to the south and picked up. Then it picked up a lot. Since we could still make out the shallow areas despite the deteriorating conditions and were just expecting the wind chop to build and build, we decided to just open up the throttle, keep the mainsail flying and get into the anchorage as quickly as we could. It was a bit tense for a while as we plowed through fairly shallow water at 6 plus knots but we made it to our intended anchorage and got the hook down before things got too bad. Shalimar opted for a slower approach but also made it without any problem albeit quite a while after us. The wind blew hard for the next three or four days, reaching almost 40 knots during one gust but mostly hanging around the 20 to 25 knot neighborhood. Dinghy rides are really unpleasant and wet in that kind of wind so we spend a lot of the time just relaxing inside the boat but we were glad that we'd made the trek down to the southeast side of the lagoon. 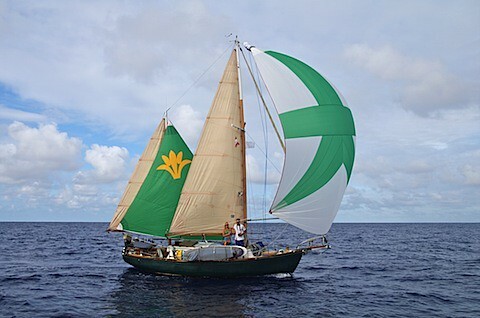 Our anchor held perfectly and we didn't roll at all because the ring of the atoll protected us from the swell. We later heard that the boats anchored closer to the pass and tied to the pier there had much more roll going on so we were glad we opted to trek down to the corner of the lagoon.